Whether the need to snack arises from genuine hunger, boredom or sheer habit, picking the wrong snacks can spell disaster if you are trying to restrict your calorie intake. To address the problem of out of control snacking, start by making plans about how you’re going to tackle your habits. Preparation is the key to success. When you open the fridge or cupboard door, the last thing you need is to find nothing except crisp, cheese, chocolates or biscuits. Plan ahead and make a shopping list of all the low calorie goodies that appeal to you. Think about how it feels when you need a snack. The usual pattern of snacking behaviour is that you get the urge to snack and then mindlessly raid the kitchen. Low calorie eating needs to be more considered. Before you head to the kitchen, take time to question whether you genuinely need to eat or whether it’s a habit that you can work at breaking. If you find that your urge is appropriate, choose the snack carefully and remember to eat it slowly and deliberately. For crunch, choose a low-fat cracker bread or ryebread. Most brands tend to have between 25- 30 calorie per slice. Don’t forget that whatever you top your snack with will also push up the calorie count. Tasty toppings include low-fat cream cheese and low-fat cottage cheese. 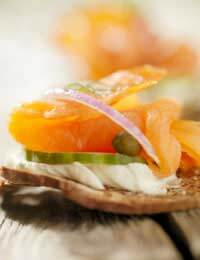 Add interest to your snack with sensible options like smoked salmon, cucumber or tomato. Celery is an excellent snack choice. Not only is it extremely low in calories but it was perfectly designed by nature so that it can be filled with lots of delicious options. For the perfect balance between crunch and creaminess, try filling with a low-fat cream cheese- either plain or flavoured. For an instant and tasty soup, all you have to do is boil a kettle and add to a small sachet of Miso. This Japanese soup base is available in all supermarkets and tastes delicious and incredibly savoury. With only around 65 calories, it’s a perfect choice. If you have a sweet tooth, you probably turn to things like ice-cream, cakes and chocolate when you feel the need to nibble. They taste great at the time but usually leave a bitter aftertaste when you start to feel guilty afterwards. Turn to some alternative swaps and you’ll still get that sweet hit without any of the guilt that follows. Frozen grapes are a gift to low calorie dieters. Wash and dry them before laying them separately on parchment paper and placing them in the freezer. They become intensely sweet and very satisfying to nibble on. A small handful of raisins should take the edge off your craving. The concentrated sweetness ensures you can’t go overboard with these tasty treats. A small portion contains around 80 calories. Microwave popcorn is a great choice. If you fancy a little sweetness, sprinkle over a few teaspoons of granulated sweetener. If you do this when the popcorn is still warm, the sweetener sometimes takes on a chewier, toffee-like texture. If only ice-cream will do, get your hands on a tub of frozen yoghurt. There is a whole range of flavours on the market and it won’t disappoint you. Average portions of frozen yoghurt contain less than half the calories of the same amount of ice-cream. Die hard chocolate lovers can still enjoy their favourite food. Beware - plain chocolate only contains marginally fewer calories than regular milk chocolate. However, plain chocolate is a clever choice, its richness means you can eat a smaller amount of chocolate but still satisfy your cravings. The higher the cocoa content of the chocolate the less likely you are to overeat. Four squares of good quality, plain chocolate will contain around 80 calories. Low calorie diets needn’t exclude delicious and satisfying snacks. With a little careful planning and research you can easily swap the old food you enjoyed for more sensible choices.